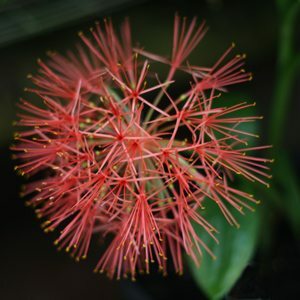 Scadoxus were previously known as Haemanthus but have recently been renamed, so lets not get confused. Scadoxus puniceus is also known as the paintbrush lily these are a summer flowering bulb that require a little space as the bulb itself is quite large. The flower appears first on a single stalk and rise dramatically to appear like a ‘red paintbrush’. The flower will last 3-4 weeks and will then die back to be followed by large strap like leaves. Other forms differ with Scadoxus cyrtanthiflorus having wonderful hanging flowers, while Scadoxus multiflorus have more open flowers (see picture right). Being a winter dormant bulb from South Africa they do require a well drained position and a dry dormancy, although we grow ours in a large terra cotta pot in the rather damp Dandenong ranges outside of Melbourne, we provide little protection from the elements and it seems to thrive. We have been growing ours in containers for over 10 years, they rarely require watering, and they need very little fertiliser. We do re – pot every 3 – 4 years with fresh potting mix. This is also a good time to dived them. Bestdone while the plants are in dormancy, just after the foliage has died back. Choose a large pot, or a well dug, well drained position in the garden. You will need a sunny position., perhaps with a little afternoon shade. These are a plant that seem to grow well even in poorer soils, however a good quality potting mix is recommended. Scadoxus are propagated both from seed and from offsets. Offsets are best divided from the parent plant immediately after flowering. They should be planted and placed in a part shaded position immediately. Clean the outer coating and pulp from the seed wearing gloves. Seed should be sown into a free draining potting mix. The top of the seed should be at surface level. From seed to flowering can take from 3 – 5 years. S. multiflorus – includes sub species katherinae, longitus and multiflorus.